Homepage. 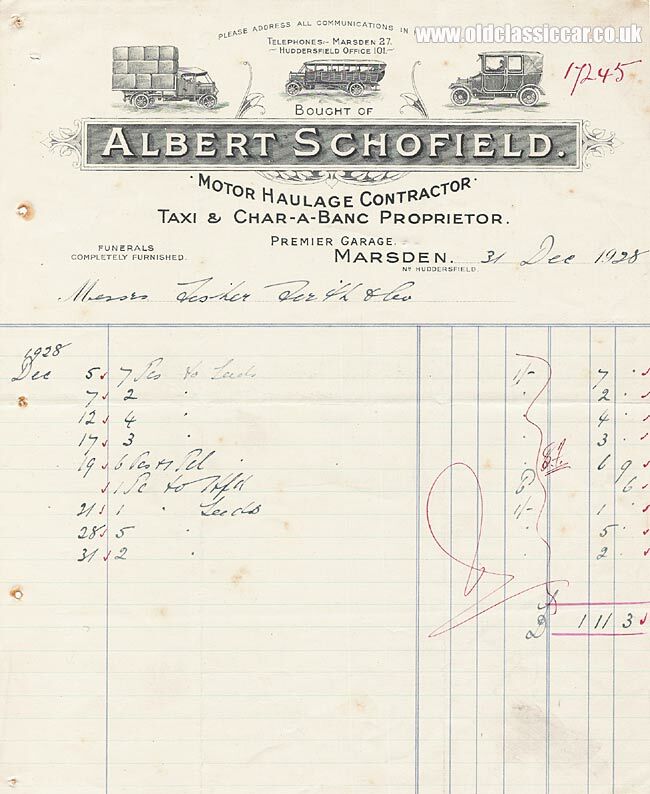 This page: Illustrated invoice used by Albert Schofield in the 1920s. This attractively illustrated invoice was issued by Albert Schofield, of Premier Garage, Marsden (nr Huddersfield) in 1928. His business was varied and revolved around the use of motor-powered vehicles, at a time when horse-drawn vehicles were still regular sights on the (often poorly finished) roads in the UK. Perhaps this company started out with horse-drawn vehicles? By 1928 they offered motor haulage, and the illustration shows a solid-wheeled flatbed lorry fully loaded with cargo. The canvas roofed lorry, still with open sided cab, looks like the kind of old vehicle (perhaps a Leyland) that might have seen use during WW1 prior to being sold off to a civilian operator. As well as road haulage, Schofield also offered a motor taxi service (note the cap-wearing chauffeur! ), and char-a-banc rides to the seaside, in another very vintage looking vehicle. 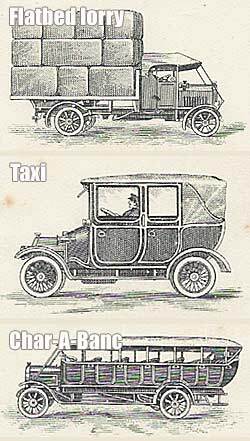 Funerals could also be 'completely furnished', so perhaps they also ran a hearse (this could be horse-drawn rather than motor driven). The invoice is dated December 31st 1928, and applies to various journeys undertaken for their customer. An invoice for another garage business, located on the same road in Marsden, may now be found on the West End Garage page.